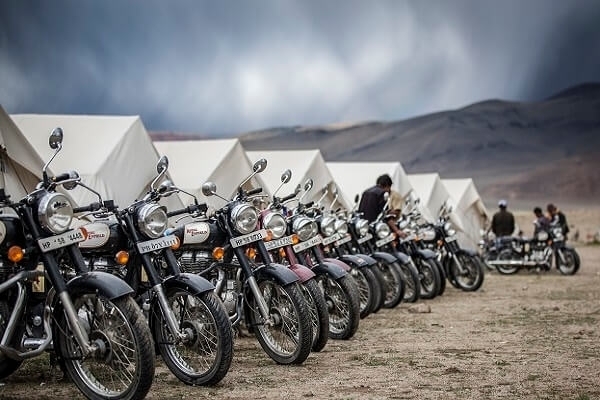 The motorbike tour at Royal Enfield from Manali to Leh in the Himalayas is an ideal destination for those who like interesting and diverse routes. 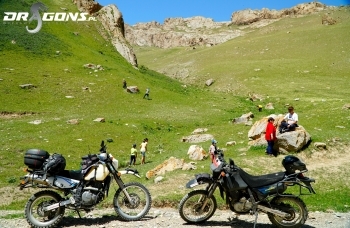 We organize motorbike tours in the Himalayas combined with exploring the most interesting sights in the region. 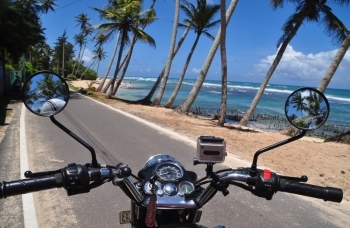 Motorbike safaris abound in the most accessible motorcycles on the roads of the world and guarantee unforgettable views and adventures. 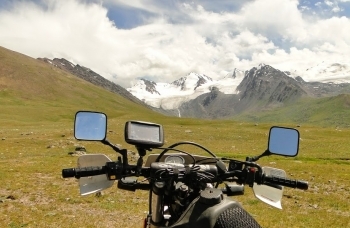 Definitely the best motorcycle tour in the Himalayas. India is the largest country in the Indian Subcontinent and shares borders with Pakistan to the west, China and Nepal to the north, Bhutan to the north-east, and Bangladesh and Myanmar to the east. India is the seventh largest country in the world by area and, with over a billion people, is second only to China in population, although its much higher birthrate makes it likely to reach pole position in less than ten years. It is an extremely diverse country, with vast differences in geography, climate, culture, language and ethnicity across its expanse, and prides itself on being the largest democracy on Earth. India's culture and heritage are a rich amalgam of the past and the present. This vast country offers the visitor a view of fascinating religions and ethnography, a vast variety of languages with more than 438 living languages, and monuments that have been present for thousands of years. As it opens up to a globalised world, India still has a depth of history and intensity of culture that awes and fascinates the many who visit there. India remains to be one of the world's fastest growing economies and one of the fastest developing countries. It is considered to be an emerging superpower. Therefore, your visit will indeed be an interesting one. Mountains, jungles, deserts, and beaches, India has it all. It is bounded to the north and northeast by the snow-capped Himalayas, the tallest mountain range in the world. In addition to protecting the country from invaders, they also feed the perennial rivers Ganga, Yamuna (Jamuna) and Sindhu (Indus) on whose plains India's civilization flourished. Though most of the Sindhu is in Pakistan now, three of its tributaries flow through Punjab. The other Himalayan river, the Brahmaputra flows through the northeast, mostly through Assam. The Deccan plateau is bounded by the Sahyadri (Western Ghats) range to the west and the Eastern Ghats to the east. The plateau is more arid than the plains, as the rivers that feed the area, such as the Narmada, Godavari and the Kaveri run dry during the summer. Towards the northeast of the Deccan plateau is what used to be a thickly forested area called the Dandakaranya which covers the states of Chhattisgarh, Jharkhand, the eastern edge of Maharashtra and the northern tip of Andhra Pradesh. This area is still forested, poverty stricken and populated by tribal people. This forest acted as a barrier to the invasion of South India. In India, it rains only during a specific time of the year. The season — as well as the phenomenon that causes it — is called the monsoon. There are two of them, the Southwest and the Northeast, both named after the directions the winds come from. The Southwest monsoon is the more important one, as it causes rains over most parts of the country, and is the crucial variable that decides how the crops will do. It lasts from June to September. The Southwest monsoon hits the west coast the most, as crossing the western ghats and reaching the rest of India is an uphill task for the winds. The western coastline is therefore much greener than the interior. The Northeast monsoon hits the east coast between October and February, mostly in the form of occasional cyclones which cause much devastation every year. The only region that gets rains from both monsoons is North-Eastern India, which consequently experiences the highest rainfall in the world. India's rich and multi-layered cultures are dominated by religious and spiritual themes. While it is a mistake to assume that there is a single unified Indian culture, there certainly are unifying themes that link the various cultures. India's cultural heritage is expressed through its myriad of languages in which much great literature and poetry has been written. It can be seen in its music - both in its classical (Carnatic and Hindustani) forms and in modern Bollywood music. India also has a vast tradition of classical and folk dances. Art and theatre flourish amongst the bustling cities of the country, against the backdrop of the ever expanding western influences. Vibrant processions are seen going on everywhere, especially during festivals. Ganesh Chatutrthi processions in Mumbai, Dusshera in Mysore etc. are some important processions which have to be seen. Along with these, marriage and religious processions are also seen on the roads. You can see people dance, play music and drums, play with colors etc. Indians value their family system a lot. Typically, an Indian's family encompasses what would be called the extended family in the West. It is routine for Indians to live as part of the paternal family unit throughout their lives - i.e. sons live together with their parents all their lives, and daughters live with their parents till they get married. The relationship is mutually self-supporting. Parents may support their children for longer than is common in the West, brothers and sisters may support each other, and sons are expected to take care of their parents in their old age. "Living with parents" does not carry the same stigma as it does in the US. Nowadays, most indian families are becoming more nuclear. Naturally, the arrangements are not perfect and there are strains and breakups, especially by the time the third generation grows up. Also, it has now become common for children to move away from the parental house for education and employment. Nonetheless, it is fair to say that the joint family is still seen as the norm and an ideal to aspire to, and Indians continue to care about their family's honour, achievements and failures even while they are not living together. Despite the weakening of the caste system, India remains a fairly stratified society. Indians care about a person's background and position in society as is the case elsewhere in the world. This attitude, when combined with the legacy of colonial rule, results in some rather interesting, if unfortunate consequences. Paler skin is deemed desirable but there is no discrimination on the basis of color. When entering India, a visa is required. You can apply for a visa: stay (for 6 months, 1 year or up to 5 years), tourist (for 6 months, without extension right on site), transit (up to 15 days). Visitor and tourist visas are issued with the right to one, two and multiple crossing the border. Entry without a valid Indian visa is possible in urgent and justified cases, for 72 hours or up to 15 days, upon presentation of a letter of guarantee from the institution, important personalities or representatives of diplomatic missions. A 12-month period of validity of the passport is required (calculated from the visa date). Entry to India should take place within 6 months of the date of issue of the visa. A transit visa is required to present a ticket for a further trip or return to the country. Visas are issued for consideration at the Embassy of India in Warsaw. It is forbidden to import and take drugs. Persons attempting to sneak drugs are subject to imprisonment ranging from 10 to 20 years. India has recently been subject to VAT. There is no limit to the amount of money you carry. You must report amounts in excess of 10,000. USD, but it is advisable to report even lower sums. No prior declaration of entry can be taken without permission up to $ 2500. The applicable customs regulations fall within the generally accepted limits. Free personal items, souvenirs worth up to US $ 100 per person, 200 cigarettes and 1 l of strong alcohol can be brought in. The importation of cameras, computers, audiovisual equipment and mobile phones is recorded in passports by the customs office. It is strictly forbidden to import weapons and ammunition. Gold and silver can not be imported except for personal use. From India can not be exported: antiques (items more than 100 years old), ivory products, animal skins, tortoise shells. Currency can be exchanged at airports, hotels, authorized banks and authorized dealers. The average daily cost of the stay may close at $ 10. Accounts of insurance are recognized in accordance with internationally accepted rules. It is advisable to buy an individual insurance package, especially as a result of accidents and costs of treatment. Worth to take antimalarial medications, antibiotics, padlocks and pens for children. Arrive in Delhi. First contact with India - with culture, also on the road. Night ride VIP-VOLVO bus to Manali. Himalayas motorbike races start time! Arrive in Manali and stay at the hotel. After breakfast, get acquainted with Royal Enfield motorbikes and workouts on Indian roads. An excellent climate (2100 m above sea level) and moderate traffic in the streets will allow us to quickly adapt to local conditions. On the program of our motorcycle trip to visit Hadimba Temple and Temple of Manu. Drive down the narrow alleyway to the village of Vashisht. There, restoring the strength of the bath in the hot sulfur springs - in the stone bath, which is located in the temple grounds. Motorcycle trip to Kullu - 42 km. There are good weather-rafting on the rough Beas River or alternatively motorbike tour of the beautifully situated town of Kullu. On the way back - visit Naggar Castle. This 100-kilometer "warm-up" will give us an idea of ? 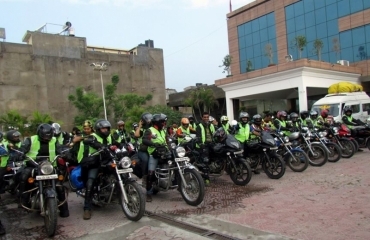 ?Indian traffic, driving habits and will allow us to "tame" Enfield's motorbike. In the evening, a welcome dinner at the hotel - tasting local cuisine. Just after breakfast, a motorcycle trip from Manali to the north. The 50-kilometer drive to the Rohtang Pass at 3980 meters above sea level. It is the geographical border between mainland India and Tibetan Ladakh. In Tibetan, Rohtang means "Stack of Thousands of Bodies". The place is rather ill-fated, it has been safe for mass traffic for several years, although it requires great caution. Adrenaline guaranteed! 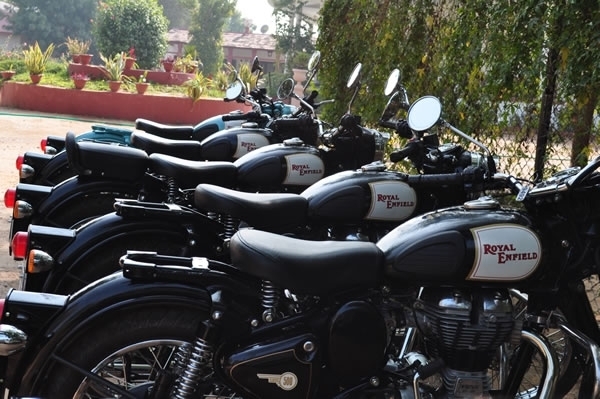 Take exit from the pass and drive motorcycles to Royal Enfield through the picturesque valley of Chandra through the villages of Koksar, Sissu, Gondhla. In the village of Tandi at the confluence of the Chandra and Bhaga rivers - the last refueling. Next 350 km. A short tour of Keylong and our motorcycle trip in the evening reaches the last "normal" hotel on the Jispa village. Our Himalayan motorsport trip begins with a "moon" route. Drive through Darcha - the last permanently inhabited settlement. We drive the serpentine to Zing Zingbar, and there is also a long drive here for the first Himalayan mountain pass - Baralacha La - 4891 m above sea level. On the way we pass Surajtal and Dipaktal mountain lakes. 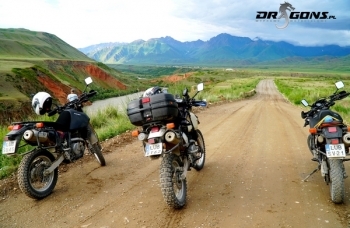 Our motorcycle trip will arrive late in Sarchu, a seasonal settlement on a vast plain. This is the point where drivers usually stay overnight. Several tents - alcohol tents, several tents with field kitchens. Accommodation facilities are tiny makeshift hotels, which also have small kitchens. Our accommodation - in luxurious tents, with electricity and toilet. 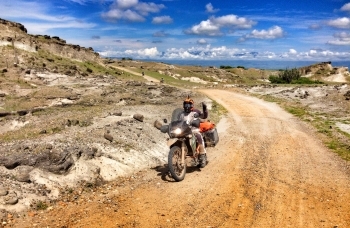 Exploring the area on motorbikes. 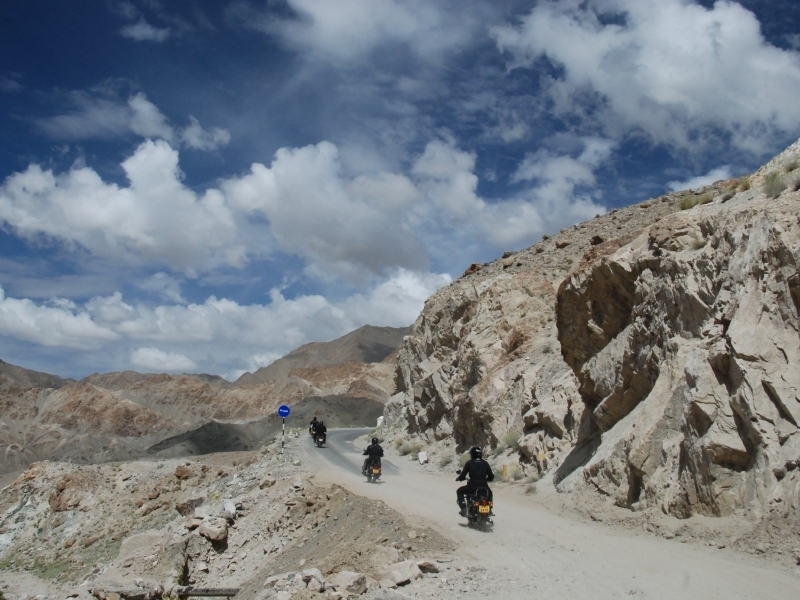 In the morning, continue the motorbike expedition through the Himalayas, and we drive motors from Sarchu to Leh. 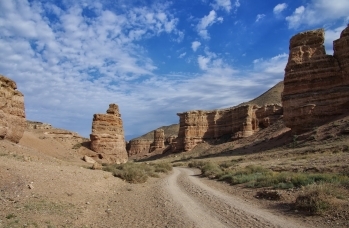 The road runs along the Yunam River, and the eye is attracted by fantastically shaped rocks. After a 20 km turnpike-21 turns known as Gatta Loops. 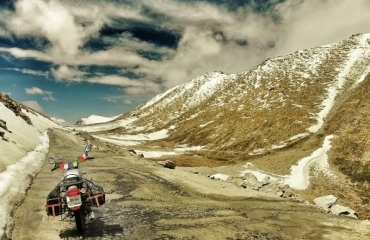 Nakee La - the pass at an altitude of 4739 m above sea level leads us to the most interesting stretch of the route. Pass Lachulung La 5059 m asl - is the first of five thousand. Another pass - Kang La - 4878 m above sea level leads our motorhome trip through the Himalayas to the Pang settlement. Rock formations resemble more Arizona than India. Pang - 4767 m above sea level - is the highest military camp in the world. After a short rest in a Tibetan camp - a motorbike trip across the Moore Plains - 4500m above sea level. Finally the opportunity to throw the fifth gear. Tangled up the Tanglung La Pass, which at an altitude of 5328 meters above sea level is one of the highest passes in the world available for vehicular traffic. Reunion through Rumtse village, Gya. We ride a deep canyon motorbike along the Kyammar River. After the control point at Upshi - last 50 km finally good tarmac. Hotel accommodation in Leh, the capital of Ladakh. On this day we are waiting for a day tour of Leh and its surroundings. Old Town Old Leh, drive up Tsemo Hill, tour of the 8-storey Royal Palace. Motorcycle trip to Shey, and there Thikse and Hemis - visiting the magnificent Buddhist monasteries. We come back to the other side of the Indus River, through villages inhabited by the Muslim population. 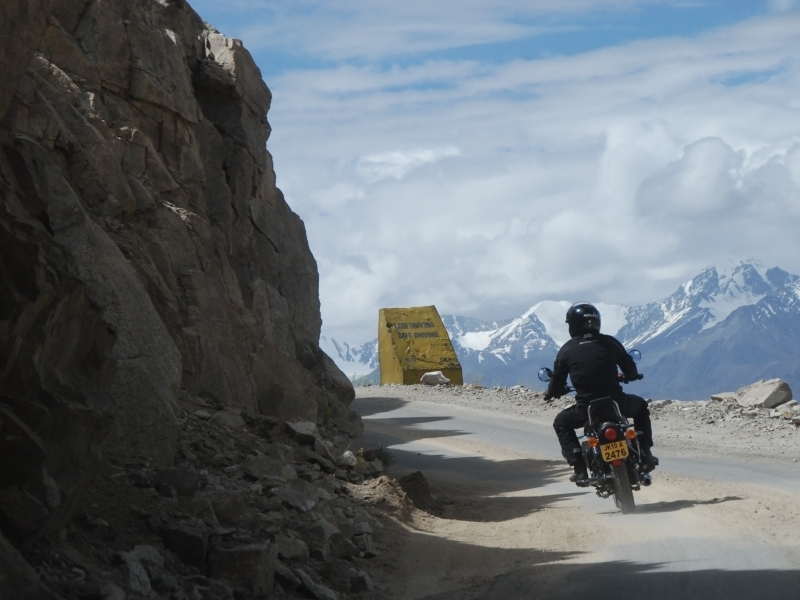 We start the day of a motorbike trip through the Himalayas from a 40 km drive to the Khardung La Pass - 5359 m above sea level. Until recently recognized as the highest pass for civil traffic pass in the world. 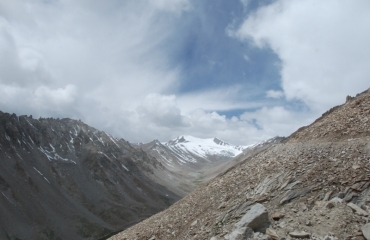 Downhill slope to the Nubr Valley, lying at the confluence of the Shyok and Nubra rivers. This huge valley, called the Valley of Flowers,Ladakh separates from Karakorum. At sunset in the village of Hunder-oasis in the desert Nubra safari on the desert dunes on bactriams, two-camel camels. Concert of local folklore ensemble in the vicinity of dunes. After breakfast at hotel in Hunder we drive 8 km to Diskit motorbikes. There you enter the hill and visit the 15th-century monastery from where you can see panoramic views of the valley. 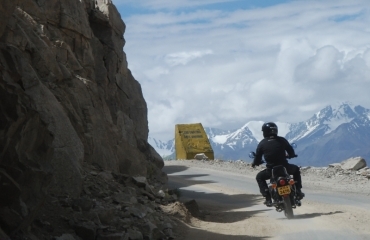 Our motorcycle tour of the Himalayas goes back to Manali. We are going over the cliffs along the Shyok River. Return to Leh through the Khardung La Pass. The motorcycle journey is slowly coming to the end, but we do not think about it, enjoying yet another adventure in the Himalayas. 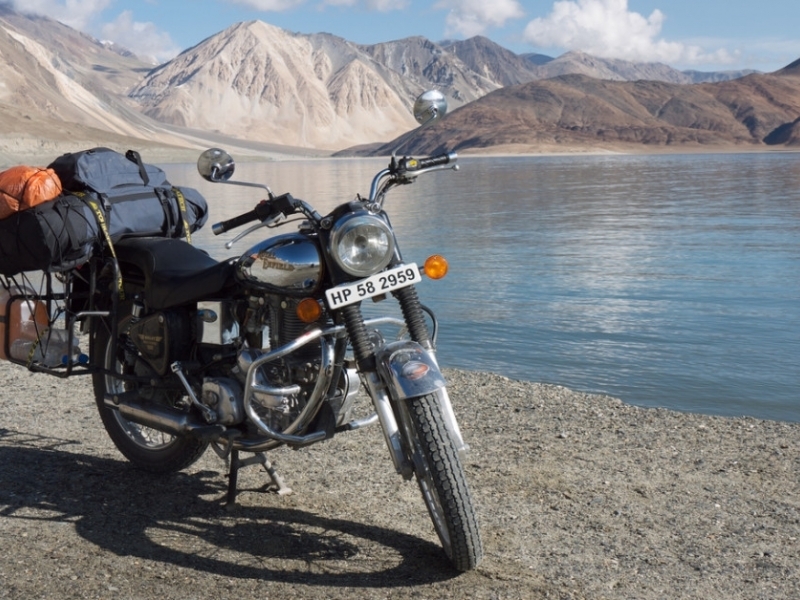 Morning break with motorcycles towards Lake Pangong. It is the highest and largest saltwater lake in Asia. Only 30% of its area is in India, the rest is in Tibet. To reach it we have to overcome Chang La - 5340 meters above sea level - another number on the list of the highest passable roads in the world! 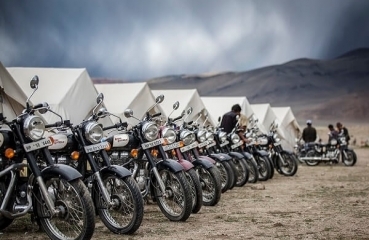 The motorcycle trip stops at a campsite in a luxury tent just above the lake at 4420 m above sea level. Morning walk through the village of Spangmik, which is cut off from the world for half a year. 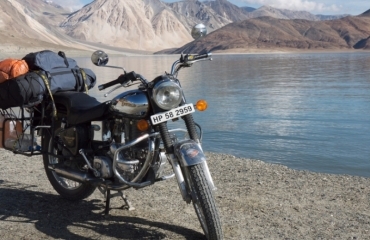 In winter the lake freezes and the temperature drops to - 45 * C. A glance at the sapphire lake of Pangong Lake and start your motorcycle journey through the Chang La Pass towards Leh. On the way visit Chemrey Gompa - a Buddhist complex located on a hill. We also admire the sunset on the hill of the Spituk monastery, overlooking the whole of Leh. Our motorbike tour through the Himalayas leads along the Indus River, Kyammar Valley, which at this time of day has a completely different, brownish-purple color of the rocks. . Driveway to Tanglung La and a brief visit to the Gompa Pass. Next is Moorey Plains motorway. Parking and local tea in the village Debring at 4570 m above sea level. This village is home to seasonal nomads from the Changpa tribe. Drive through Pang along rivers, streams, between fantastic rock formations. 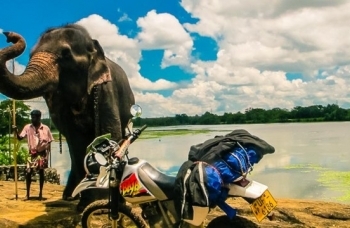 We drive the Gatta Loops motorbikes overlooking the Tsarap River downstream. 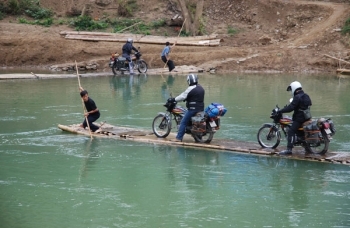 On the trail of a motorbike trip through the famous bridges with grateful names Whiskey and Brandy, Jispa. After leaving the village of Jispa again the route of our motorbike expedition through the Himalayas leads into a lunar, deserted land. Farewell with five thousand passes. Rest in Keylong before the steep drive of countless streampit on Rohtang Pass. In the evening we report with our motorcycles Royal Enfield in Manali. 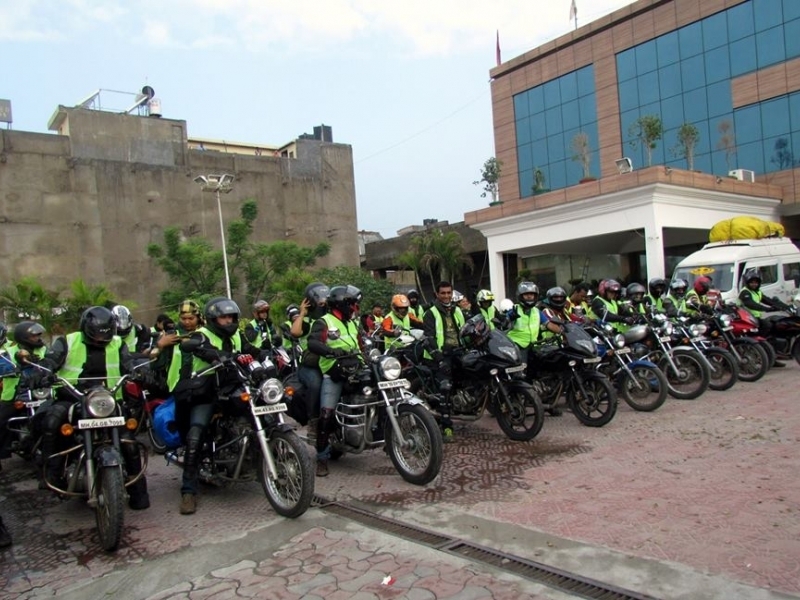 This day came a time after our Himalayan motorcycle adventure to rest and explore Manali. Walk the streets of Old Vashisht, full of traditional old buildings. For willing short trekking to waterfalls. Afternoon transfer to Delhi airport. 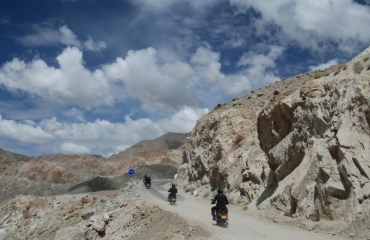 We are finishing our journey, but this is not the last motorcycle trip in the Himalayas. 1. Headwear: Warmer day hats and cooler earrings for the night. 2. Sandals and sports shoes. 3. Clothes: several t-shirts, several pairs of socks and underwear for change, jeans, shorts, swimsuits, warm sweater, sweatshirt, winter hat. 12. Sleeping bag and mat. 1. Waterproof boots best breathable and in shoe pads. Comfortable shoes, mountain boots, ankle boots will also work out. 2. The raincoat from the rain. 3. Gloves on a motorcycle. 5. 12v socket for connecting in a motorcycle. 6. Motorbike and luggage straps. 7. Helmet - Indian helmets are of poor quality and hardly buy. 8. Face shield - sometimes dusty. Rohtang La is a mountain pass in the Himalayas with an altitude of 3979 m above sea level. It is located in India, Himachal Pradesh. It is located about 50 km from Manali. This pass connects the Kullu Valley to the south, with a humid climate inhabited by Hindu followers of the Lahaul Valley, with a slightly less damp climate, and swollen by Buddhists. On the south side of the pass is the Bjas river, and the northern river is Canaab. Coming from Manali, we are waiting for a Himalayan 50 kilometer drive to the altitude of 3,980 meters above sea level - at the Rohtang Pass. It is the geographical border between mainland India and Tibetan Ladakh. In Tibetan Rohtang - means "Stack of Thousands of Flesh". The place was covered with bad name, only for several years safe for mass traffic, although requiring great caution. Bara Lacha La is a mountain pass in the Zanskar Mountains that connects Ladakh to the Indian state of Himachal Pradesh. 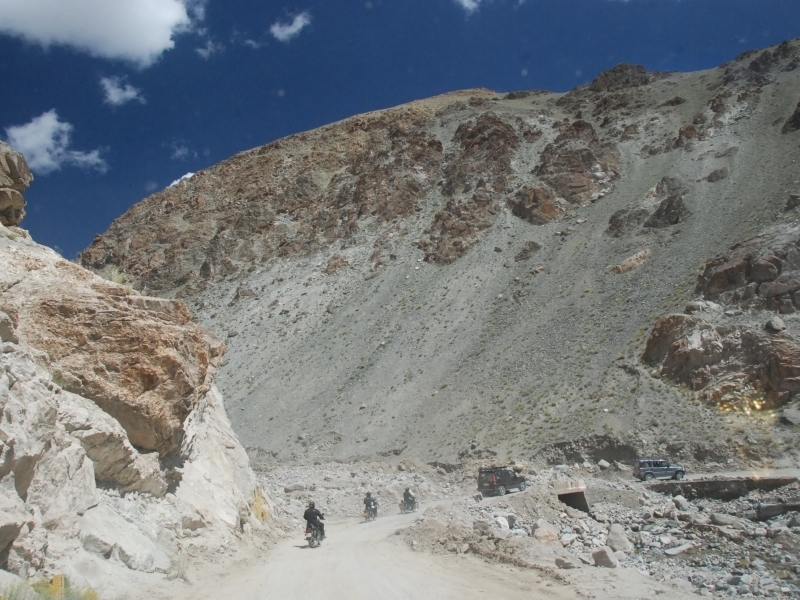 It rises to an altitude of almost 5000 m asl and forms part of the Leh-Manali road. 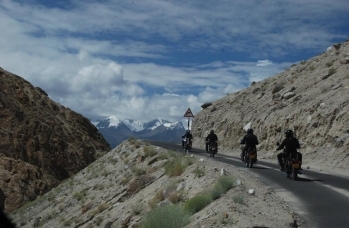 The summit of the pass is a crossroads of the former trade routes extending to Spiti, Lahaul and Zanskar. The surrounding slopes run down the rivers and waterfalls, and the Sun Lake (Suraj Lake) is nearby. The emerald water from which the river Bhaga flows. White snow and burgundy rocks adorn the green and blue stripes of water and clusters of five-color cloths that indicate that Tibetans or Tibetan rulers live in the area. Earth, air and water elements are found here in the raw, primitive, almost "geological" form. Every breath is like the height, and the winds of the sharp wind smear the faces of the wanderers. Nakee La is a Himalayan mountain pass that leads from Manali 20 km of streamers and 21 turns known as Gatta Loops. Pass at an altitude of 4739 m above sea level leads us to the most interesting section of the route and Lachulung La Pass 5100 m asl - it is the first of five thousand on the route of our expedition motorcycles on the Himalayas. 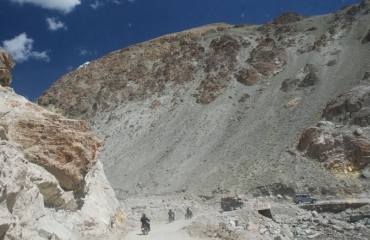 Lachulung La - 5059 m asl is a mountain pass on the Leh-Manali route. 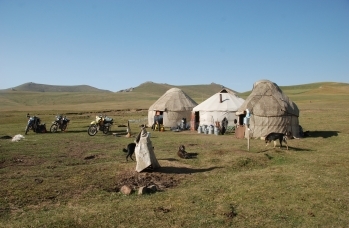 It is 54 km from Sarchu and 24 km from Pang village. 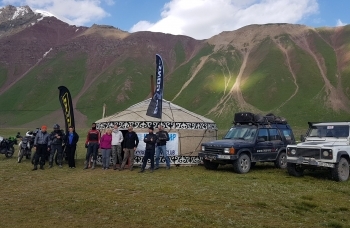 This is despite the height of one of the easier to pass the Himlaj Pass, although some people may have trouble breathing and symptoms of altitude sickness. Kang La is another pass on our motorcycle trail through Himlaje at altitude of 4878 m asl, which leads us to Pang village. Rock formations resemble Arizona more than India. 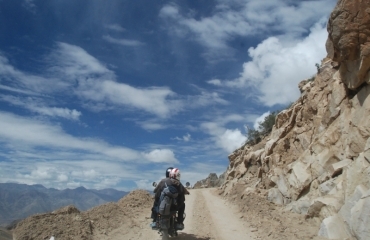 Kang La was a traditional route used by Lahaulis (Lahaul people) to cross Zanskar and further to Ladakh. The length of the pass is about 24 km. The triple crossing of Kang La is rewarding a great scenery. See meadow meadow with carpet of wild flowers. Around us snowy mountains and glaciers. 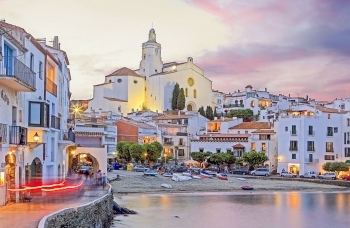 You may feel like a retreat in time looking at the surrounding nature, the monasteries built on the rocks and quite primitive life of the inhabitants. Pang, located at an altitude of 4767 meters, is the highest military camp in the world. Moorey Plains (Morey Plains) - amazing, long 30 km and wide for about 500 m flat, like a table-like plains-like gorge. 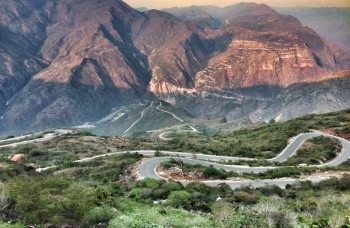 Passing this way on our motorcycle trip we will see amazing, breathtaking scenery. 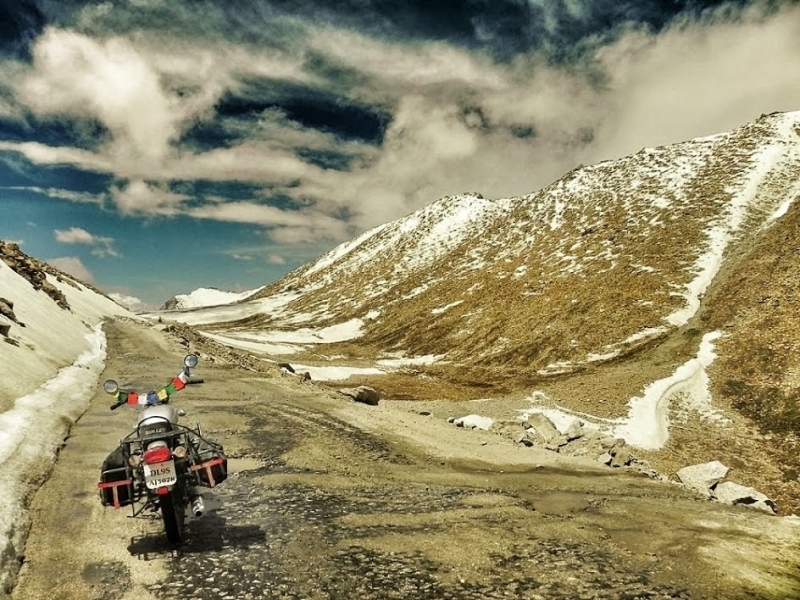 It is hard to believe that you are riding a motorcycle through the Himalayas over four and a half kilometers above sea level. The trail of rocky-rocky ground raises dust clouds. 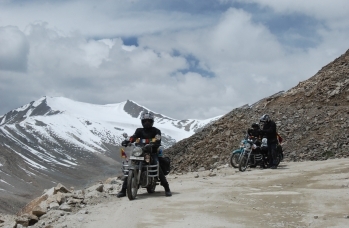 With the end of Morey Plains, a ramp begins at the highest point on our route, the Tanglang La Pass, which is also the gateway to Ladakh. Taglang La is a mountain pass in the Himalayas with an altitude of 5328 m above sea level. It is located in Ladakh, India. It is one of the world's highest passable pedestrians. The road has been hardened for a few years with the exception of a short section of about 500 m, where there is a dirt road. Khardung La is a mountain pass in the Himalayas, 5359 m above sea level. It is located in India, in the state of Jammu and Kashmir, in the Ladakh region. 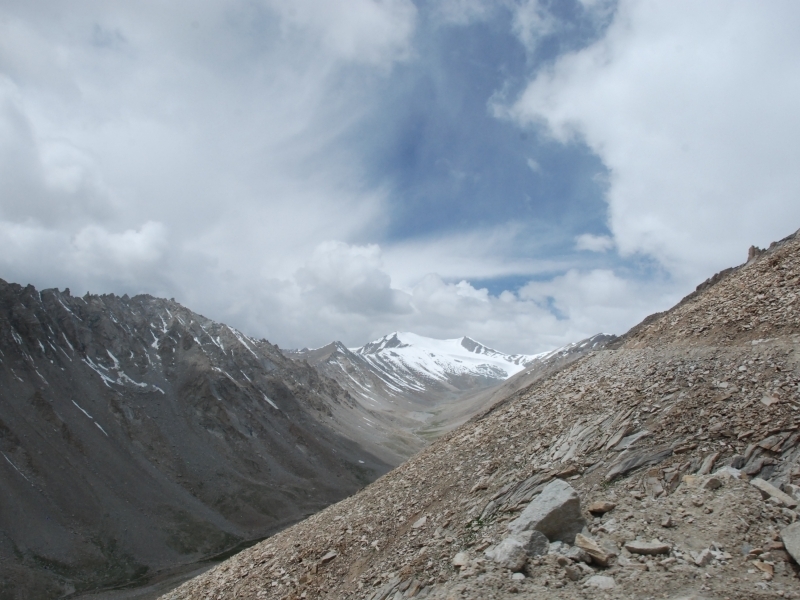 Until recently the height of the pass was reported as 5602 m asl, making it the highest pass in the world. Recent research has shown that the actual height of Khardung La is 5359 m, and the highest passing pass is Semo La, which is 5565 m. The Khardung La Pass is 37 km from Leh. The lower parts of the road to the pass are covered with asphalt, but the higher parts are covered with gravel or mud due to melting snow. Nubra Valley is an unusual place in Ladakh. For tourists only opened in 1994. 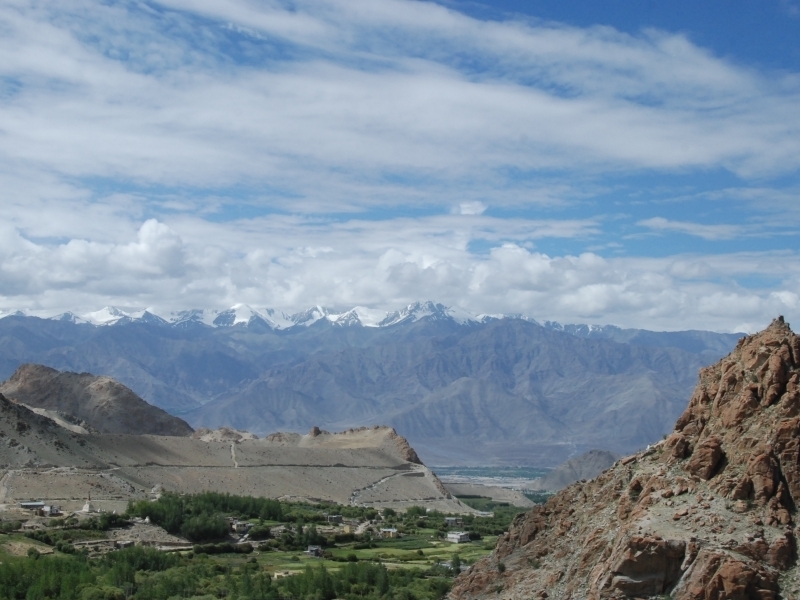 The valley is located at an altitude of about 3050 m above sea level, at the confluence of the rivers Shyok and Nubra. 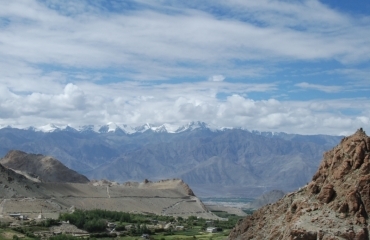 The valley separates Ladakh from Karakorum. Near the river is an agricultural valley, while the higher slopes of the mountains are desert - sand desert with sand dunes. To nubry come in And cross the Khardung La Pass. 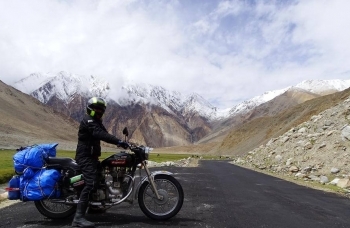 The valley is one of the links between Ladakh and Pakistan - by the famous Siachan glacier and China through the equally popular Karakorum and Saser passes. 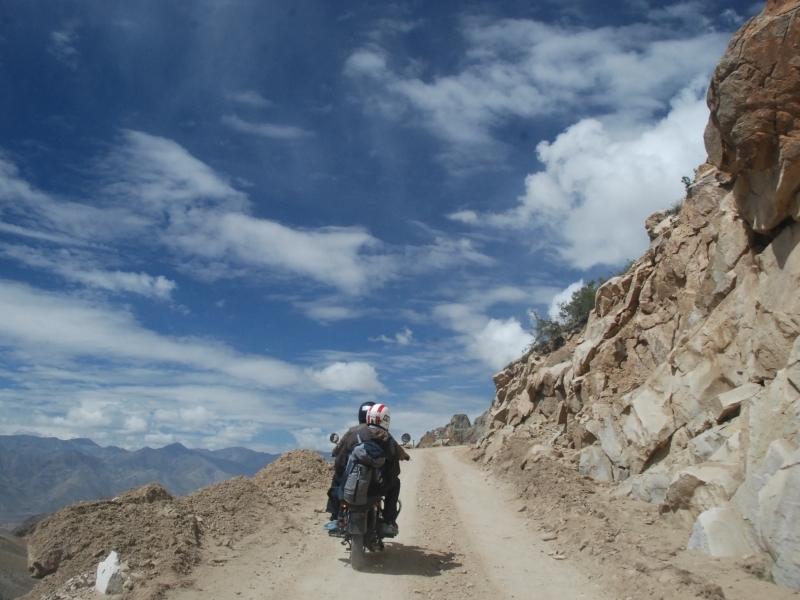 Chang La is a pass leading from Leh to the great salt lake of Pangong. It is reportedly the third highest passage road in the world. Chang La Road goes through the mountainous terrain without human settlements except for the tiny Tangtse settlement. However, there are sometimes nomads from the Changpa tribe. According to legend, he used to live here, although it is not known exactly when and where, a sadhu, Changla Baba, who was so big guru that his name was called a pass. But it's just a legend. Pangong is the highest and largest saltwater lake in Asia. 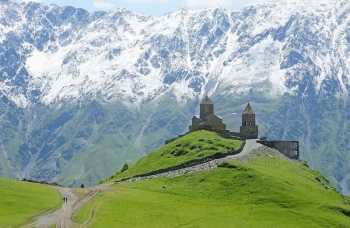 It lies at an altitude of 4350 m above sea level. It is about 134 km long and 5 km wide. Only 30% of its area is in India, the rest is in China. It is a disputed area of ​​both states. In winter the lake freezes completely, even though its water is salty.